As the party started their long climb to the Sigil Door (via the Planewalkers Guild – “six hours straight up through the ivy” the lillend said) they rolled a random encounter and Methikus came up – a Baernaloth. My players know what devils and demons are but had no idea what a yugoloth was. He was walking on the underside of the stairs they were walking up. The perceptive cleric, Tufast, heard him (it?) coming and everyone tried to make stealth checks while the dextrous monk, Sylvanus, peeked over the side of the stairs. She was confronted by the baernaloth who was dressed in grey rags and cried tarry tears. The immediate reaction was “I don’t know what it is, it looks bad, leave it alone”. Unfortunately the stealth checks were all good except for the fighter, Brokthar, who rolled a 1 (with disadvantage no less) making a scrapping noise and drawing the attention of the Methikus who stopped and peered up as Sylvanus, who was just peeking over the edge, slowly drew her head back like some cartoon character. The baernaloth gave a horse like laugh before continuing on its way – it had more pressing Blood War business to deal with for now. Though it would have loved to torment these clueless mortals. Languages Abyssal, Celestial, Common, telepathy 60 ft.
Magic Resistance. The baernaloth has advantage on saving throws against spells and other magical effects. Magic Weapons. The baernaloth’s weapon attacks are magical. Multiattack. The baernaloth makes three attacks – two with its claws and one with its bite. It may also use Agony or Ecstasy on any target it has injured in the last 1 minute. Savage Claws. Melee Weapon Attack: +13 to hit, reach 5 ft., one target. Hit: 12 (1d6 + 9) slashing damage. Savage Bite. Melee Weapon Attack: +13 to hit, reach 5 ft., one target. Hit: 12 (1d6 + 9) piercing damage. The target must make a DC 17 Constitution saving throw, taking 10 (3d6) poison damage on a failed save, or half as much damage on a successful one. Agony. Baernaloths never use weapons or equipment of any kind, even magical items. Accompanying these physical attacks, however, are two strange powers relating to the baernaloth’s goal of causing pain and spreading misery. Three times per day, the creature can cause wounds created by his claws and mouth to worsen, tearing open painfully. With this attack, the baernaloth can wreak the same amount of damage that he has previously inflicted upon a foe in one round sometime during the last 24 hours. There is no saving throw against this ability (although magic resistance still applies), but the target must be within 10 yards, and within sight. This ability can be used in addition to the baernaloth’s normal attacks during a single round. Ecstasy. Conversely, a baernaloth can instantly heal any or all damage that it inflicts. This can be done as often as it likes, with a range of 10 yards. It uses this ability to keep captives – and even foes in battle – alive so that the fiend can continue to inflict pain. Obviously, the baernaloth is intelligent enough to keep from using this ability in a way that puts itself in jeopardy (by healing its opponents too much, for example). 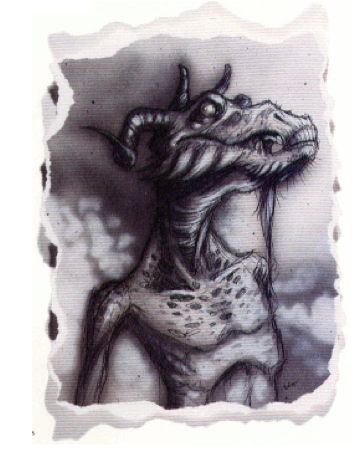 Long, gangly limbs covered by purulent gray flesh; an over-sized, horned head with an obscene mouth comprising nothing but teeth and tongue; distant, glazed yellow eyes dripping fluid far more vile than tears – all these things are a baernaloth, yet it is more. The essence of the creature is callous detatchment, never seeing the suffering and pain that it ceaselessly creates; an unending, unsatiable need for misery and affliction; a monster that mechanically, methodically hurts, harms, foils, impairs, and hinders all other creatures. In many ways, the baernaloths are the outcasts among the ranks of the yugoloths. They rarely associate with other yugoloths, and are always found on the Gray Waste, never on Gehenna, where so many of the others have migrated. Some people wonder it perhaps the baernaloths are not true yugoloths at all, but rather some older, even more primal creatures. If this is true, baernaloth and yugoloth alike are propagating some sort of intentional deception (not that such a thing is at all inconceivable. As “greater” yugoloths, baernaloths may be the weakest of their type when it comes to sheer might. Nevertheless, they are afforded a great deal of respect from their kind (when the rare occasion occurs and they actually come upon other yugoloths) – far more than their physical or magical power would warrant, for reasons unknown.